"Lady of the Lake" comes in with the trifecta of mystic keyboards, jazz-bass, and stunning guitar soloing. In 1976 this 10 minute epic initiated a 30 year love-affair. Starcastle's mixture of symphonic rock and powerful rhythm section invited the listener to spin the album time and again. And I whole heartedly admit that I did. Upon each listen the melody, harmony and groove would find different avenues through my cortex to weave its magic spell. It seems hard to believe that something that was created by such a young group of musicians has had the lasting power that this debut album retains. Listening today brings back all the awe that it did when I was a teenager. Bassist Gary Strater has the rapid bass grooves that defined much of 70s rock-n-roll. His ability to give a song a unique aura allowed the other talented musicians to fill in the rest of the picture. Steve Hagler and Matthew Stewart were the tandem guitarists that soloed when necessary but usually played the counter-melody fills. The keyboards and awesome vocals of the entire band provide catchy melody that float along the surface of your mind. Terry Luttrell was the lead vocalist, but harmony is just as key as lead here. The vocal tracks may be what get you listening, but it is the guitar/keyboard inter-play that starts to pierce your soul. And just when everything is moving, Strater and drummer Steve Tassler lay down the groove that hooks you for life. 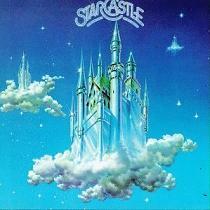 Drummer Stephen Tassler agreed to inject some insight into the making of the classic Starcastle album. ...A major concert promoter from St. Louis, Contemporary Productions, consisting of Irv Zuckerman and Steve Schankman, were interested in becoming managers. They heard the first Golden Voice tapes, loved the stuff, and decided to take us on as a project... They had us re-record Lady of the Lake and Forces in a St. Louis studio run by a guy named Steve Littman, who began working with Contemporary Productions as well, and is mentioned in the first record credits. They shopped the tapes, and a couple of labels were interested. Of course we were signed to Epic after Aerosmith's manager came out to see us at a club near St. Louis. I guess they thought we were OK, and gave CBS the green light. The music business was at the time, and for the most part still is, who you know and who you owe! The rest is history (well, almost). We learned about the signed record deal by a phone call during a party on the night of my 21st birthday, April 2, 1975, at the band house! I will never forget the feeling. As you can imagine, we were ecstatic. (Cake, and eating it too!) We had a lot to learn, however. Starcastle, although only 40 minutes long, contains one powerhouse after another. "Elliptical Seasons" has a killer bass grove running through it with amazing harmonies. "Forces" is a classic of 70s prog-rock. Luttrell has the vocal quality to carry this song while the rest of the band interject changes, fills, and counter-melody. "Stargate" is a nice instrumental that acts as an intro to my favorite Starcastle tune, "Sunfield". "Sunfield" just soars. Herb Schildt takes his keyboards all around this tune and once again the rhythm section acts as the driving force. The time and effort, the sharing of ideas, and the complete interaction of the band members is what one remembers from Starcastle. "To The Fire Wind" and "Nova" could only be made by a band that was completely in sync. "Nova" has the fastest tempo on the album and closes out leaving the listener dieing for more. ...Personal favorites are just that....People have different memories and favorites, maybe having to do with their part in the song, either playing or writing. My feelings of the songs have to do with how they changed, how they came off live, and how I felt when I played them. Herb may feel completely different due to the problems he might have, such as how much time he had to change a Mini Moog sound or whether they stayed in tune. Terry may feel differently depending on whether he could hear the monitor of if the drums were too loud, etc. I've always enjoyed Lady of the Lake. We played it at Gary's benefit after rehearsing it a few times the day before (after 25 years!). Everyone had to relearn their parts, and did it individually before we got together. I was able to glue them all together, fortunately. I think we've all been playing it in our sleep after all these years. Elliptical Seasons was a nice follow up to Lady of the Lake, especially with it's quieter opening. I recall playing it with Matt outside the control room with his Strat, sans amplifier, and with my crotales. Vicari came through and wanted to record that sound, because it breathed so well, but we didn't end up doing it. This song fell out of the repertoire after Fountains of Light. Forces changed quite a bit over the years, until it found it's lowest common denominator. The beginning part was pushed aside, and the song became more powerful. We also played this at Gary's benefit, along with Change in Time, after opening with Shine on Brightly from Citadel. We opened our show with Stargate, and the recording of it was used before a good number if 9:00 news shows, I'm told. Playing it live was always very dynamic, although it would have been fun to get all the percussion stuff working live. These days I could use samples and drum pads, but back then I couldn't afford all the gear that Carl Palmer had behind him. My favorite song from the record is Sunfield. I think it is one of the best things we did. Compositionally it's the most interesting to me, I loved to play it. It could really get going live, too. It would go from being very quiet to a tornado of sound. It's my all time favorite SC song, and I'd love to play it again.